A rustic venue among the mountains... the perfect place to gather together your loved ones for a day with a difference! Rustic weddings are always popular as they offer an intimate atmosphere and a unique experience surrounded by the beauty of nature. 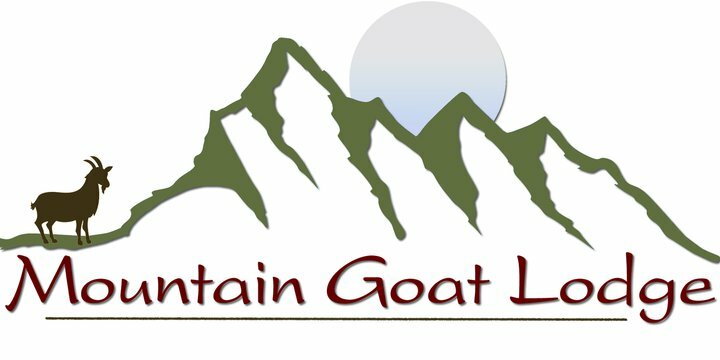 The Mountain Goat Lodge is the venue of choice for your rustic wedding. Ceremonies and parties here give you flexibility and affordability plus a fabulous setting. Your every need and desire can be catered for and your guests will be accommodated in style and comfort. Most couples choose to get married in the pasture, and with such a breathtaking backdrop, it's easy to see why! To save your catering from being devoured by gate-crashing guests before the party starts, we'll put our goats in the front yard. We'll provide all the electricity and lighting for the tents and venue, adding antique-style Edison lights for a touch of vintage romance. Photo ops with our darling goats, chickens, ducks, and llama are included free. Our lodge and trailers combined accommodate approximately 32 guests each night, with more room available for tent camping at no extra charge. And of course, there's always the tipi! Our parking lot holds around 35 cars. To book the whole place there is a minimum three-night stay, plus a modest facility fee for each function (i.e. rehearsal dinner one day, wedding the next). There is a additional cleaning fee which includes removal of all trash and recycling. For rental of tents, tables, chairs, and a dance floor, we recommend Settings Event Rental. Call 719-539-2434. We highly recommend reserving your dates as far in advance as possible to ensure we can accommodate your needs. Simply call us or click to check availability. Together, we can make joyous memories on your special day - animals included, of course!